Thank goodness for daylight savings time. 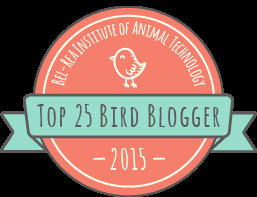 Otherwise, I would have probably missed out on 3 birds this week. First, I went back to that cattle/horse farm in Salem county down by the Cowtown Rodeo to look for the Yellow-headed Blackbird right after work on Wednesday. I have been here 3 other times looking for the Crested Caracara and the YHBB (Yellow-headed Blackbird) and have busted every time. 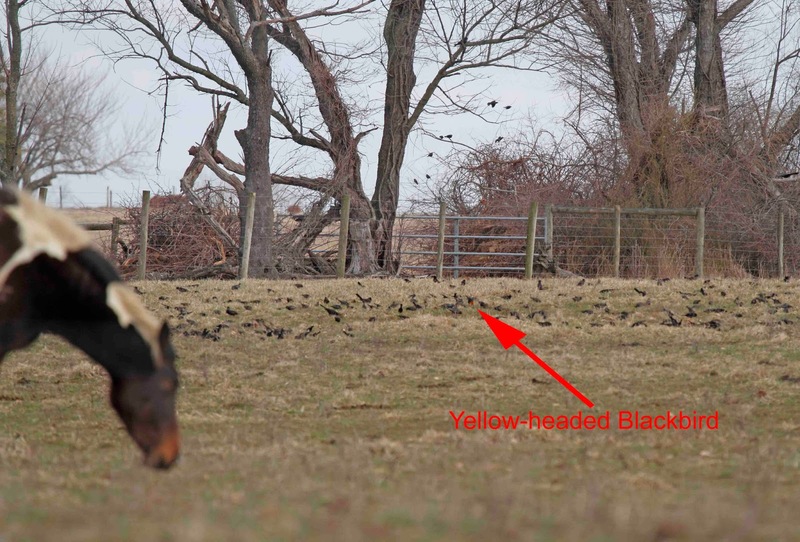 Well, I finally had success thanks to a couple of ladies who were scanning through the thousands of blackbirds and found it. There were a thousand birds. Our bird was "behind the horse" (not kidding). This is our view. 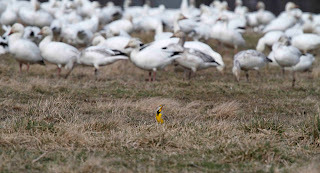 I had a bonus that day when a thousand Snow Geese flew in and landed in one of the fields. While scanning the flock looking for anything unusual, 2 terrific things happened. First, the Crested Caracara flew above the geese right through my binocular view. 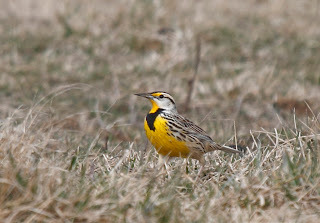 Then, I heard a Meadowlark and then saw him popping around in the grass in front of the geese. Pretty cool! 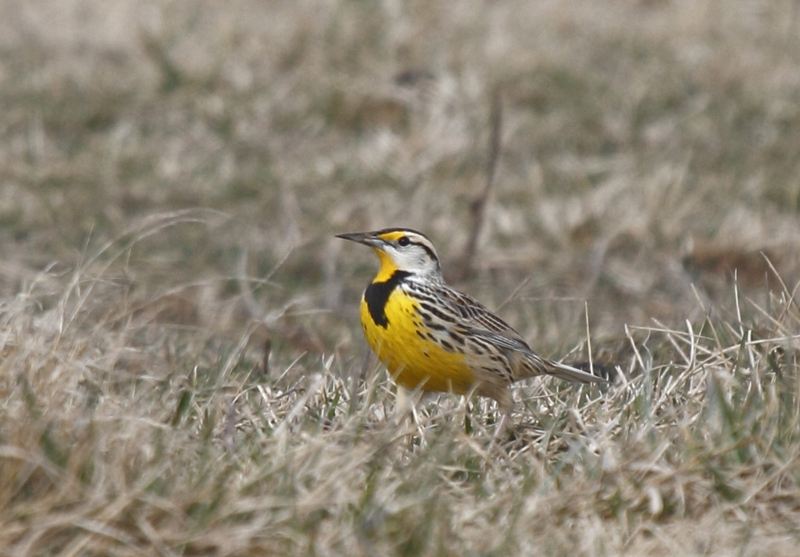 I didn't get a very good photo of the Caracara, but I did get goot photos of the Meadowlark. These are pretty birds with a great song too. Here is the best photo that I have of one. Thursday after work, Patty and I took a mad dash to Asbury Park to try to see a Pacific Loon that was reported there by a very reliable source - Scott Barnes from the NJ Audubon. He gave us great directions and also great tips on how to differentiate the Pacific Loon from the Common Loon. It only took us 20 minutes to find the Pacific Loon. 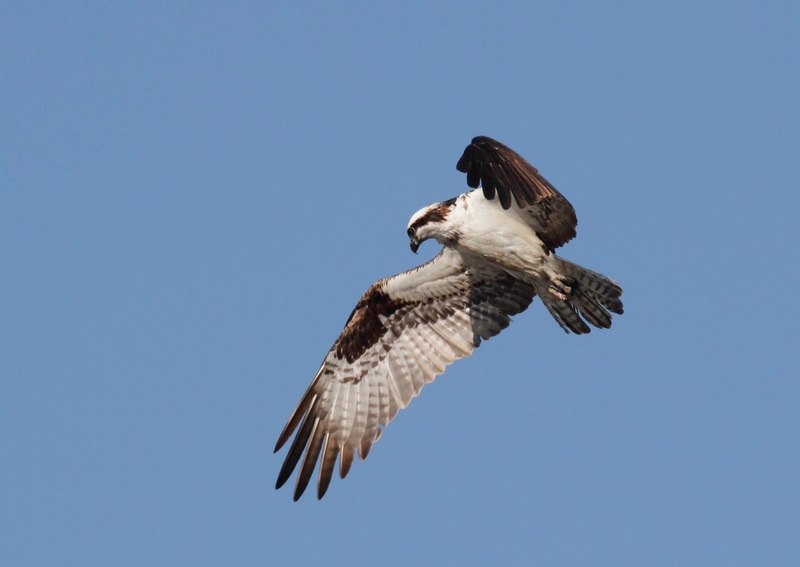 Unfortunately, the bird was too far offshore for a good photo. We had to use scopes to identify the bird. 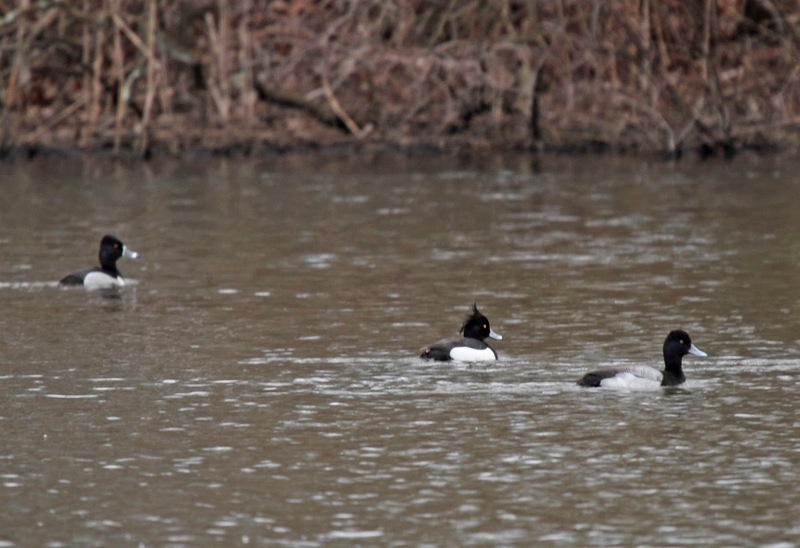 As if that wasn't enough for the week, an email came in on Friday stating that a Tufted Duck was being seen at Parvin State Park - once again in Salem County NJ. Once again, I dashed out of work and was rewarded with a life bird and another bird to add to the Big Year list. It was also a great learning experience for identifying ducks that all look very similar. Check out this photo. 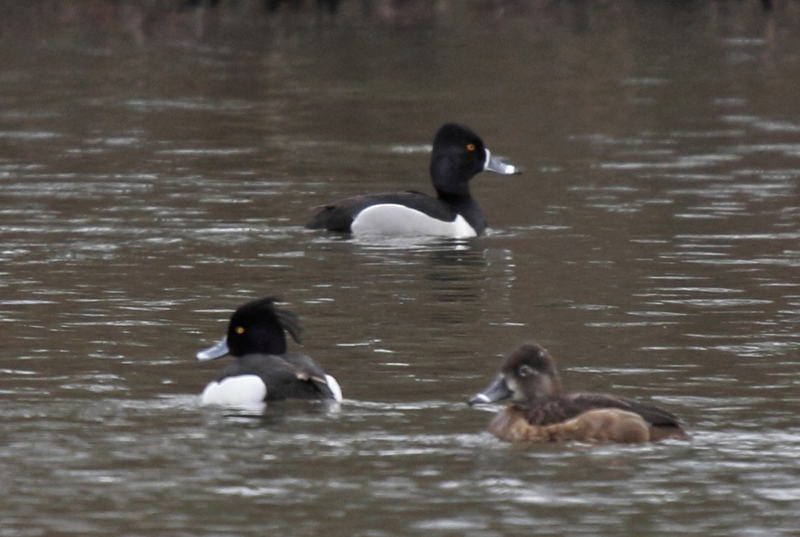 There are 3 different species of ducks in this photo - Ring-necked Duck on the left, Tufted Duck in the middle, and Lesser Scaup on the right. They all look alike at first glance but take a closer look. 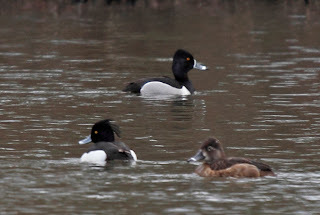 The Tufted Duck has the tufts of feathers on the back of his head which is the obvious tip but also notice the bright white sides and black back. The Ring-necked Duck should really be called Ring-BILLED Duck since it has that fancy bill but is also has gray sides (and no tuft). 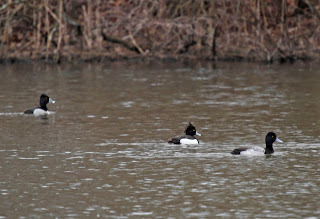 The Lesser Scaup has a gray back and rounded head. Here is another photo showing which 2 species? But wait, there's more. 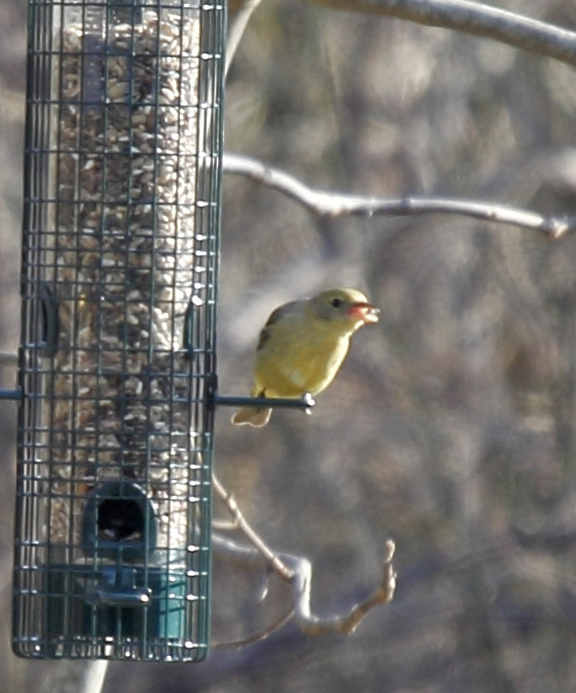 Remember back in December when I saw the Western Tanager in Cape May Courthouse (Hanging on the Corner)? Well, it doesn't count for the contest since I saw it in December and never bothered to go look at it again in January before it disappeared. Guess what? 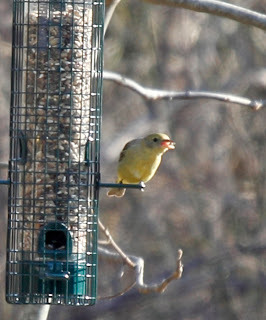 Another one just showed up in Cape May Point at someone's bird feeder! Here is a recap of my day today: Dog field at 7:15, packed up and out the door by 8:30, picking up a server from a firehouse at 9:30, coaching a playoff hockey game at 11:15 (W), playing a hockey game at 12:45 (L), eating lunch at 2:30, viewing the Western Tanager in Cape May at 4:15, taking a photo of my FOY Osprey and Blue-winged Teal at 4:45, searching for a gull at 5:30, home by 7:30, and writing this at 10:00. Oh, did I mention that we have company staying with us this weekend?